Have you started looking for Halloween costumes yet? I've used both purchased and homemade costumes for my kids over the years, and I have no problems with either. I have found that the best way to go about homemade costumes is to take some store bought items and combine it with a handmade item or two to make it extra special. This year, one of my twins decided to be a cow girl because we received a straw cowboy hat as a hand-me-down from one of my coworkers. 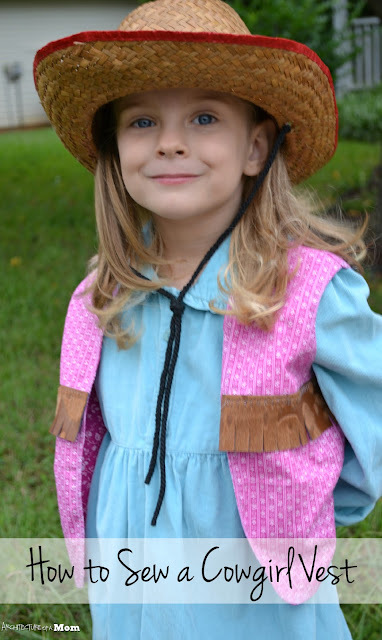 I looked at the clothing that we have for the twins and decided that a corduroy dress that we have is very "prairie" dress, so with a hat and the dress and a sparkly belt (because no outfit is complete without said sparkly belt) we were almost ready to say "Yee-haw" and ride out into the Halloween sunset. Almost. 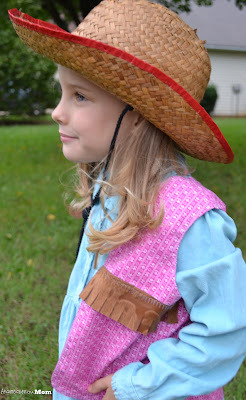 We needed a cowgirl vest to finish the look, and although sewing up this vest takes a little more skill than sewing straight lines (hello curves!) you can still sew this up in an afternoon, from start to finish. I was inspired by Simply Crafted's Cowboy Vest. However, her little boy at the time was a 3T/4T and my 4 year old girl is wearing 5T shirts, so I took her technique and enlarged her pattern. You could also take a shirt that fits your child loosely and use that to make a pattern. To enlarge the pattern up one size, I printed Simply Crafted's pattern, then cut it out, but made it longer and a little wider when I cut it out. You can trim off but it's harder to add on. Then I pinned together the pattern and tried to put it on my daughter and could tell the arm holes needed to be a little bigger so I trimmed that. Then you place the front pieces onto the back pieces, right side in. 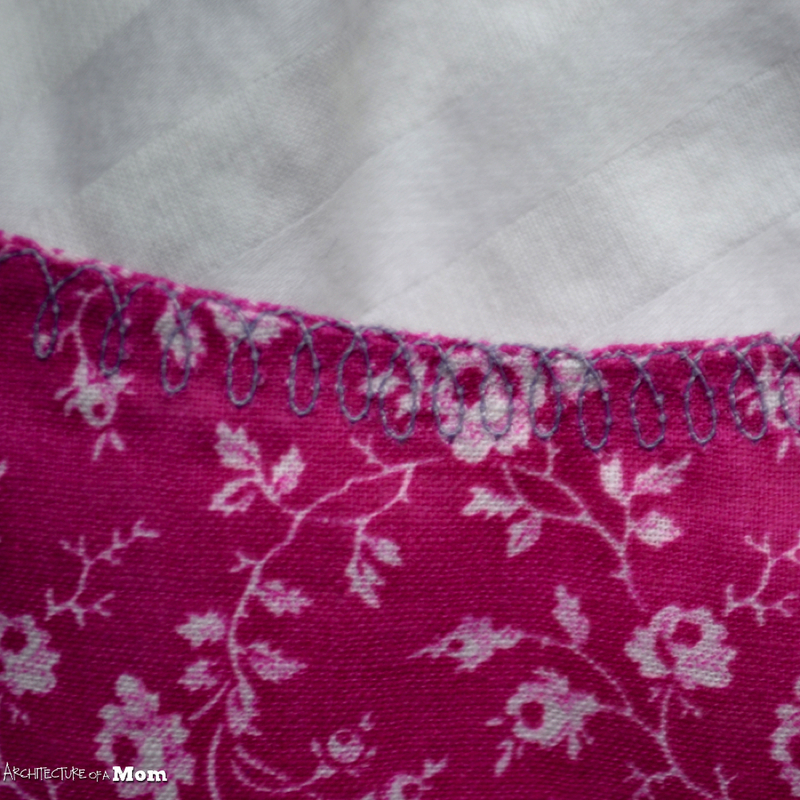 Stitch along the side seam (the seams under the arms) for both the outside fabric and the liner fabric. Use 1/4 inch seam allowances. 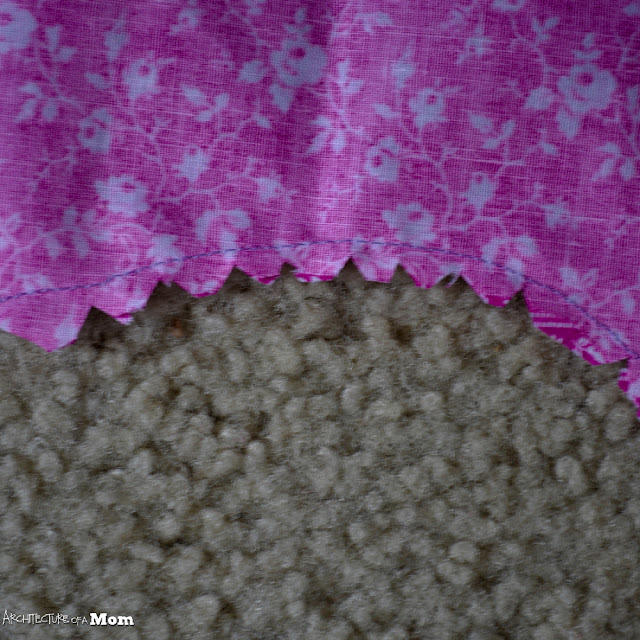 Press your seams flat, then pin the lining to the outside fabric, again with the right side of the fabric in. Sew all the way around the outside with 1/4 inch seam allowances, leaving about 3-4 inches open so that you can turn the whole thing right-side out. 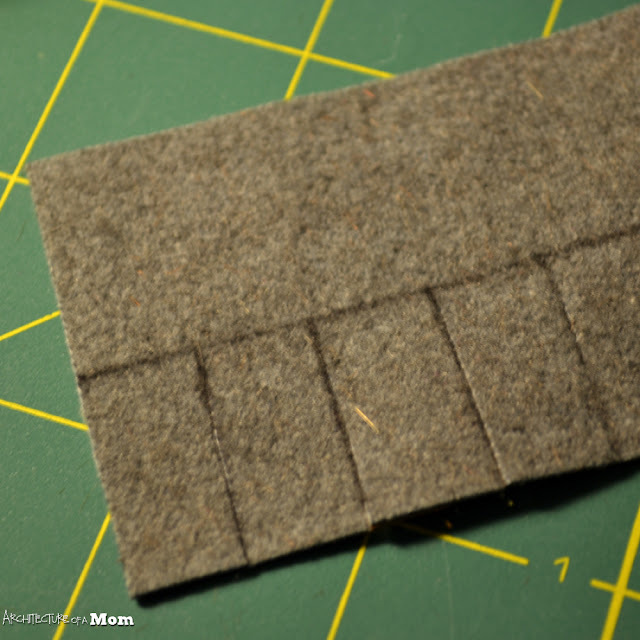 Cut little v-shapes in the armhole seam allowances. This helps remove some of the bulk in the seam. 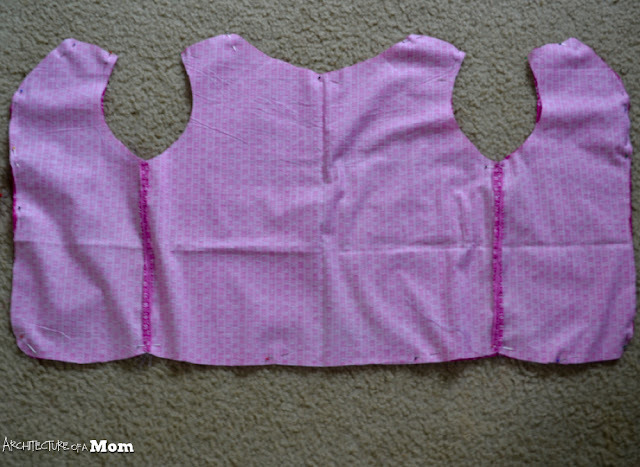 After you turn the vest right-side out, press all your seams. This makes your vest lie flat. Use your iron to press the opening so it aligns with your seam. Edge stitch around the whole edge except at the top of the shoulder pieces. This will close up your turning opening. You can do a couple of things to dress this up. You can use a contrasting thread color, or you can do what I did: find a decorative stitch that you like and use that to do the edge stitch. Edge stitching makes the piece have a finished look, and I love how this looped stitch reminds me of saddle stitching. Overlap the back and front shoulder and top stitch. Repeat for other shoulder. Take the faux leather and flip it over to the back. Cut two 2"x8" strips. On each piece the back, mark a line at 1" (half way longways). Mark lines every half inch from one edge to that middle line. Cut along the lines every half inch to make a fringe. 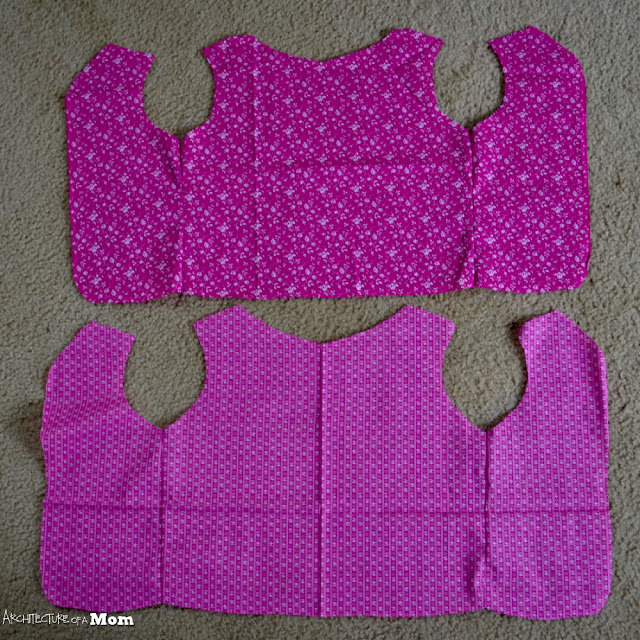 Place fringe on the front part of the vest, starting at the seam under the arm and running horizontally to the front opening. Stitch the top of the fringe onto the front of the vest using a decorative stitch (I used my loop stitch). Repeat for the other side of the vest. And now your little cowgirl is ready to herd some cattle! 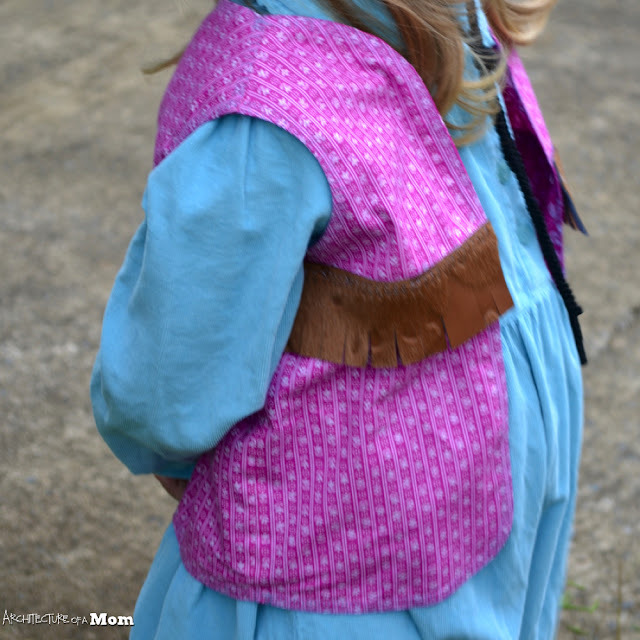 PS I wrote this for a little girl's costume, but with the right material this can be a cowherd vest for any gender! Enjoy!